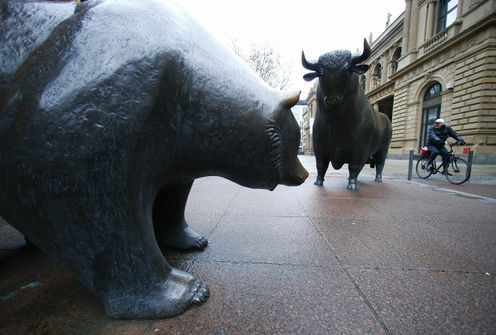 Sharemarkets: a bear market, a correction or just volatility? If you have just come back from a summer break, or had switched off your communication devices at home, you may have missed the fact that 2016 has opened with a run of losses on global stock markets, many now exceeding more than 20% from 2015 highs. Let’s leave aside for the moment what might be driving this current dip in stock prices, and ask one small technical question: what is the difference between a market correction and a bear market? The answer is that a correction describes a short-term dip in stock prices, while a bear market is a longer-term downward trend in prices, normally one that drops more than 20% from a peak. In a correction therefore, the expectation is that prices will stabilise or even rise again in the future. In a bear market the expectation is that prices have fallen and may continue to fall for the foreseeable future. So how can we be talking of a bear market only a few weeks into a new year, based on a run of a few poor days for global stock markets? Here things get tricky because some markets are indeed now much more than 20% off their 2015 highs, even though it has taken only a few weeks to get there. Even more confusing is the fact that many market analysts are actually still predicting stock prices to rise over the course of this year. So if professional investors can’t even agree on the direction of the stock market, what sense can ordinary punters make of warnings that we may be in or entering a bear market, or that this is just a January correction, and the market will recover later in the year? The difference between a correction and a bear market is thus more ambiguous than at first encounter. The categories of bear market and correction were developed in quieter times, when asset prices were less volatile, and fewer people were exposed to movements in stock market prices. If you do not need to sell stocks to live on, then a six month or even one year slide in stock prices may not be all that significant and you might see it as a correction. But if you need to sell shares or are about to retire and need to calculate your superannuation payout, then even a few weeks fall in prices may start to look like a serious bear. Part of the current confusion is also that for the past seven years central banks have been pouring money into financial markets to stabilise asset prices and stimulate growth. The price of money has fallen to almost zero, and so its been hard to price risky assets like corporate stock. But with the US Federal Reserve attempting to lift rates ever so gently, investors are having to learn to price risk in again. We still don’t know what happens when risk gets priced into markets again. But already this year we can see that volatility is back as the new normal. Welcome to 2016.